Note that points.com no longer allows Aeroplan to US Airways transfers. Aeroplan is the primary currency for most Canadians. Some redemptions are better deals than others, so I’d like to highlight some of my favourites. I’ll be covering three Aeroplan flight awards in this post, all of which can avoid fuel surcharges. This posts lists the airline carriers which do incur fuel surcharges on an Aeroplan flight award. This award was devalued to 55,00 miles each way. This is one of the most basic Aeroplan flight redemptions. It’s what I talk about with people first getting into miles and points, since it’s easily achievable. It just also happens to be one of the best programs for flying to Europe, as other programs charge at least 50,000 miles for the same redemption. 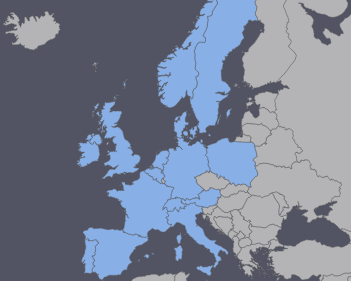 Europe 1 consists of most of Western Europe, including Austria, Belgium, Denmark, France, Germany, Ireland, Italy, Netherlands, Norway, Poland, Portugal, Spain, Sweden, Switzerland, United Kingdom. By using a carrier that Aeroplan does not levy fuel surcharge (YQ) on, such as United, Turkish, Brussels, Scandanvian, or Swiss, you’re able to get a ticket that normally goes for over $2000 for $100. These are all great products, for the most part. Swiss normally has some availability on Zurich – Boston, while Turkish has good availability on Istanbul – Montreal. Scandinavian is getting their planes retrofitted with a new staggered business class. Air Canada Super Elite members also have a fuel surcharge waiver on Air Canada flights to Europe, which began March 1st along with other Altitude changes. This is also a fantastic value if you happen to know someone who has a top-tier status and will let you use their account. 😉 For those who really want to fly First Class, a good option is leveraging Lufthansa’s capped fuel surcharges from North America. Award space to Europe with Star Alliance is slightly more difficult than to Asia (and easier than to Oceania), but with some flexibility, you can fly in a high level of comfort to your destination. For me, the journey is just as important as the destination. That might not be the case for some of you, but the power of miles gives you the option to fly in style. I highlight this redemption because it’s so easy for Canadians to get to this point. By signing up for just two credit cards, the TD Aeroplan Visa Infinite and the American Express Gold Card, you already have more than enough miles for this redemption. Since the annual fees are waived for the first year, and have 25,000 miles as a signup bonus, it’s essentially free if you exclude opportunity cost. See my posts on the waived annual fee promotion on the TD card, and the increased American Express card offers. The award chart divides Asia in to two zones, but includes both North and South Asia in the same zone. 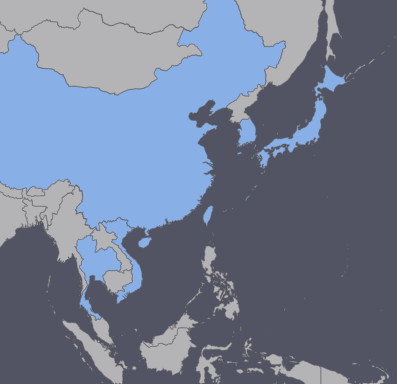 Asia Zone 1 includes China, Hong Kong, Japan, Macau, North Korea, Singapore, South Korea, Taiwan, Thailand, and Vietnam. This redemption also requires many fewer miles than if you used other currencies. Most programs for a similar redemption would require at least 45,000 miles. By flying Singapore, Air China, or EVA, you can avoid fuel surcharges. Intra-Asia travel is deceptively long. Although a flight like Singapore – Tokyo which would seem pretty short, it’s nearly as long as New York – London. 14 hours of business class flying for 30,000 miles is quite a good deal. What I like about this redemption is that you have a lot of flexibility with your routing. As an international itinerary, you can include an unlimited amount of 23-hour layovers as long as you are under the maximum permitted miles. 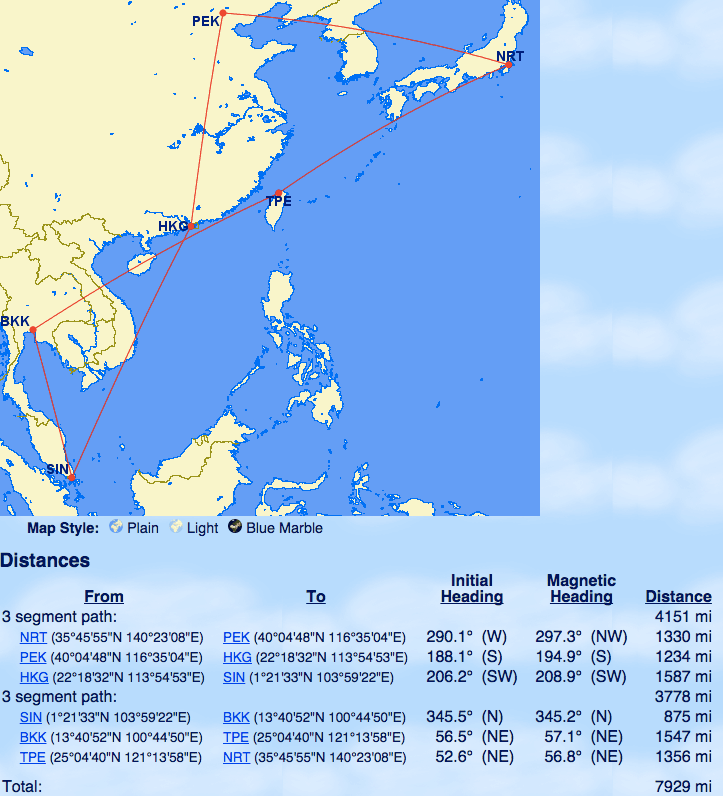 I could fly from Tokyo to Beijing to Hong Kong to Singapore to Bangkok to Taipei to Tokyo, with 23-hour stopovers in Taipei, Hong Kong, Bangkok, and Beijing, all for 30,000 miles. It’d be quite crazy, but a very good “value”. This can’t be booked online since the routing is so complex, but should be able to be ticketed via the phone. With flights on carriers with no fuel surcharge, such as Air China, EVA, and Singapore Airlines, you save even more on taxes and fees although intra-asia surcharges are very reasonable. The awards do not permit stopovers, but do allow one-open jaw, meaning you could pretty much cover a lot of ground if you nested this award in an Asia trip. I don’t talk about Aeroplan flight redemptions to South America much simply because the flights and hotels there are not as spectacular as Europe or Asia/Pacific. However, Aeroplan actually has a very good award rate for flights to South America if you start your ticket in Hawaii. It’s actually cheaper to fly from Hawaii as a ticket from North America to South America goes for 95,000 points in business class. 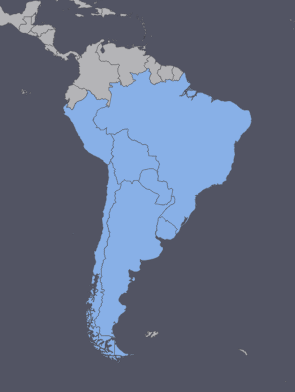 Aeroplan’s Southern South America region is nearly the entire South American continent. It includes Argentina, Bolivia, Brazil, Chile, Paraguay, Peru, and Uruguay. Since Aeroplan prices the itinerary based on point of turnaround, and not highest transited region, this means you can leverage the lower award cost by starting from Hawaii, then simply using the North America – South America roundtrip portion. For example, take a look at the following itinerary. The Hawaii – South America award allows for a stopover via North America. To my knowledge, Aeroplan prices an award at either the point-of-turnaround, which in the above award is Chile, or the highest-price region. Both North America and South America are 80,000 points from Hawaii, which allows for a very interesting itinerary. How I look at this is that instead of paying 95,000 miles leaving from North to South America, you can start your award in Hawaii and get a free-one way, and save 15,000 miles. In this case, I have my Honolulu – Vancouver flight in March, and my North America- Santiago – North America portion in May. I’d use the first flight as part of another trip, for example if I used Avios to fly to Hawaii. Then the rest of the award becomes the standalone trip in May. You essentially get two trips for one here. Again, the online engine limits you to one stopover OR open jaw, but you can call in for another stopover in addition to your stopover or open jaw, which means you could essentially get one South America trip, and two halves of a Hawaii trip. Via points.com, you can transfer your Aeroplan miles into other airline miles. The best ratio on that site is for US Airways, at a 1:0.84 ratio. This isn’t technically redeeming your miles for Aeroplan flights, but I consider this a great value of Aeroplan miles when redeeming for international first class. This is because US Airways has a much cheaper award chart. Take Australia; US Airways charges 140,000 miles in First Class for that award. Aeroplan charges 150% more, requiring 220,000 miles in First Class for that award. For more details, see my post on transferring Aeroplan miles to US Airways. The only catch is that you’re limited to moving 100,000 miles out of Aeroplan per calendar year, meaning you’d need to have a stockpile of US Airways miles already, whether from previous Share Miles promotions or other means. The easiest way to top up at this point, if you know you want to fly First Class on oneworld carriers with your Aeroplan, is getting the American Express Starwood Preferred Guest Card, offering a limited-time 20,000 points (25,000 Dividend Miles) signup bonus. See my post for details about the increased signup bonus. Keep in mind that Dividend Miles merges with AAdvantage very soon, closing this opportunity. The easiest way to boost your Aeroplan balance are through credit cards. The TD Aeroplan Visa Infinite offers a 25,000 Aeroplan mile signup bonus, as well as the American Express Gold Card, offering 25,000 points as a welcome bonus. Both come with no fee for the first year, so are essentially free. American Express Membership Rewards, as well Starwood Preferred Guest also convert to Aeroplan at a 1:1 ratio. While AMEX doesn’t have the best acceptance, their cards to have the best signup offers. Their Platinum Card comes with a 60,000 point signup bonus and their Business Gold Rewards Card offers a 40,000 point signup bonus. While not as high, the Starwood Preferred Guest Card comes with a 20,000 point signup bonus, which is the best offer currently and historically. There are of course a multitude of cards available in the market which offer travel rewards as well, but Aeroplan in general offers a much stronger program with more redemption options and on the whole return a better value. Aeroplan flight redemptions are the best values in the program. Credit cards do come with their risks. You have to be financially stable and be able to control your spending if you are opening credit cards. See my posts on how to monitor your credit score for free and the basics of credit card churning. Hi Jeff, how can you get 1:0.84 ratio for points.com conversion ? I got a lower ratio. Thanks. You have to change your location away from Canada, which will give you a better ratio. Great info. Thanks for posting all of this. Like many others, I am frustrated that not all flights from Star Alliance partners appear on the Aeroplan redemption website. I tried to replicate the exact European trip you showed and the United-Scandanavian airline combo did not appear in my search results. I am getting familiar with the ANA tool to be able to see these flights, but how were you able to see that flight on the Aeroplan website? That was just the date I searched. Usually combos like that don’t appear online so you do have to call it in – this routing just showed up so I took a screenshot of it. Interesting quirk about the miles needed to go Hawaii to southern South America. In your example, is there any reason why you couldn’t have a routing HNL to SCL return, with a stopover in YVR in both directions? You could, but it won’t price online since the engine only allows for one stopover or open jaw. I was under the impression that Canadians cannot book flights if a flight doesn’t originate or end in North America. How do you book inter-Asian flights? That’s not the case… You can book an intra-Asia redemption online or on the phone. How would you tie this into an award that would make sense? PVG/SHA – HKG (spend 2 days) – HKT I don’t need to return anywhere as my final destination is HKT as I’m on a separate award with Etihad afterwards. Could I make this work and book it with a flight returning back to PVG/SHA ? Or any other options you might suggest. That wouldn’t work with Aeroplan – in that case I’d recommend using two separate Avios awards. Got it. How about out of TYO can I do another stopover elsewhere in Japan then head over to HKT? In that case, it’d be easier to patch the intra-Japan flight with Avios before using Aeroplan. I have 300000 Amex Points and 200000 Aeroplan. Is this enough for 2 x business class flights for the long flights and short haul I will just buy an economy tickets. YYZ – HKG – SIN – YYZ. Travel date is for the month of July. My dates are flexible can extend 2 or more weeks and a few more destination and open jaws are also ok.
Yeah, that should be enough, since Asia 1 is 150k per person in business class. I don’t understand how you can get from Canada to Euro Zone 1 for 45,000. Isn’t it 60,000 just for economy? It used to be 45,000 for one-way business class. Thanks for all the great info, Jeff. Just a question: you refer to fares that aren’t necessarily visible on the Aeroplane site, but that may be available through the call centre. Do the call centre agents have access to info on available routes that we can’t see on the website? The call center agents have exactly the same flights that are available online – however they are able to book itineraries that don’t show up on the website. It doesn’t mean that the call center agents have access to extra flights, but that they have a much more sophisticated search and booking tool. Which Airline alliance is best way to fly within Australia or is it better to buy cash fare? Avios here would likely be your best option. No, stopovers of more than 24 hours on one way tickets are not permitted.